I have spoken before on the blog about the value of establishing expertise in your industry and demonstrating authority on relevant subjects. When people need advice or second opinions on issues that they’re concerned about, or just want to know more about, they turn to Google, or to social media, or to online forums to canvas their peers. Including good solid advice and insight, without an overt sales push which can offset the value of the advice, should really be part of your content strategy whatever industry you’re in. While you can measure the success of these pieces to a degree through Analytics and page conversions it can be really exciting to receive validation by your advice being passed on and shared. I admit, I need to get out more! This isn’t always traceable but I recently noticed an interesting referral source on client Calder Security’s web metrics from mumsnet.com. 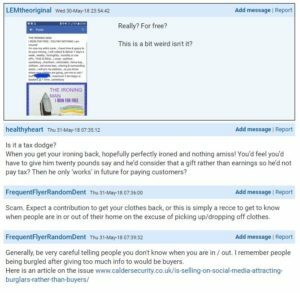 On closer inspection I discovered that a link to one of our blogs about the potential dangers of revealing too much information when selling through social media sites could make you vulnerable to would-be burglars. You can see the original blog here. 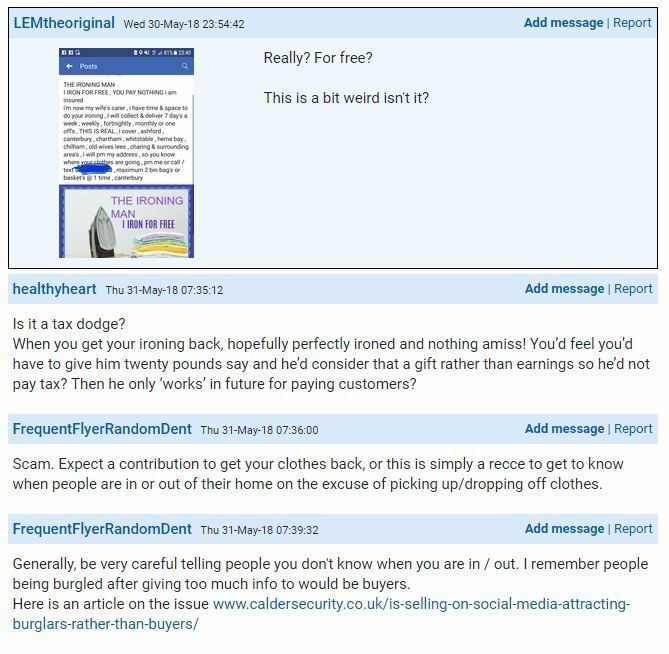 It was posted on a forum thread about an ironing service that seemed too good to be true with a concerned mumsnetter worried that it may be a scam. Our blog had been shared as an authority piece explaining how these scams can operate and what people can do to protect themselves. You can see here how this recommendation by a third party immediately raises our perceived authority in the area of home security way beyond any share from our own social media or marketing channels can offer. You can see the mumsnet.com thread here. This is the kind of sharing that you want to achieve with your content. Create pieces that are centred on the topics that people care about. Offer an insight and empathy to the issue and provide advice and tips on dealing with it. Make sure your title reflects the issue well and you include some good keywords and phrases related to the topic so that your piece will filter into rankings when people are searching on that topic. Be generous with your knowledge. Obviously don’t give away all the tricks of the trade but be confident in your own expertise to share some proper insight that people can use. If it makes sense to people and they can use it to help resolve an issue, that will build your expert status and when they do have a need for your products and services that will give you elevated differentiation from your competitors. Plus, you may experience the thrill of having your blog shared on a major influencer such as mumsnet.com (I think that’s pretty cool! ).